Manifesting 123 and you don’t need #3 is unique in the manifesting and positive thinking literature because it clearly describes how our thoughts create anything. To put it simply, our repetitive thoughts create form and outcomes. Wendy’s story illustrates another tool for manifesting: focused determination. A few years back I was talking with my sisters after our mom was diagnosed with breast cancer and I clearly remembered my saying that,” Just watch. I’ll be the one to get cancer out of all of us.” Six months to a year later cancer is what I got. I pray regularly and use manifesting, but I did ask many times to win the lottery and that never happened. How is it that I made one dumb comment about cancer and it showed up? Jeez!! It is a certainty that the disease changed me profoundly and I am no longer the same person having gone through that long ordeal. A cancer diagnosis presents a number of distressing possibilities: the possible loss of life, marriage, and financial devastation. As it turns out, everything was a blessing and I have no regrets. I am alive and disease free for the last 9 years. We did lose our home during that time, a result of the large medical expenses, but the good news is that my husband and I have a stronger marriage than before and my present life is a happy one. We have reestablished ourselves, I have created my own career and the business I own sustains and fulfills me. How did I survive this tragedy and emerge in a better place? First, I focused on survival and everything I did was to that end: to stay alive. Concurrent with that was my secondary focus: failure will not be an option. After getting the diagnosis of breast cancer, those two highly focused thoughts became my life. I was not going to fail. I would get through this. There were enormous trials: four surgeries, our huge financial problems and the ever-present pain, but through it all I stayed focused. A couple things I want to pass on here. My husband is in the insurance business and we had a decent healthcare policy. We never dreamed it wouldn’t be enough. We didn’t have an additional, long-term disability policy either. It would’ve been a tremendous help during the surgeries and treatments. My job at the time was in sales and my employer allowed me to work from home as best I could. Going through bilateral mastectomy and reconstruction leaves you very weak most days and I began to dream of some other career. I needed to create a career and company of my own. I was very ill and weak but suddenly in a hurry to take care of the loose ends in my present and plan for that new career in my future. Art and design is in my genetic makeup and with all of those trips to oncologists and reconstruction doctor exam rooms, I could not help but notice how the interior spaces could be improved. As a patient, I could see the need for carefully chosen artworks that would enhance those healing spaces. I developed a third goal in those waiting rooms, to start an art consulting business and place works of art to better comfort and heal. I began my research even as I was being treated. I put together a formal plan and presented it to my business friends who subsequently gave me the green light. It is not my husband’s nature to take risks, so THAT was a huge hurdle for me to get through. Thankfully, I met and formed a business partnership with the owner of an art manufacturer, Anne Strickland, and she helped me get my business off the ground. Once my husband saw what we could do, he then supported me in my dream and the practical and financial requirements came together quickly. Everything I had focused on came to pass and I now own the successful art consulting business I visualized. It is a pleasure to have a number of hospitals as clients, a very fulfilling aspect of my business. Everyday I wear a cancer bracelet to remind me of my good fortune. I do a lot of counseling and speaking with other women on the topic to help anyway I can. It is a difficult and life-changing experience to all involved and hearing another person that has been through the surgeries and different treatments is extremely helpful. Professional counseling is a must. I know because I went forward without it, making everything all the more difficult and emotionally painful. There is more to tell but here is an important point. After reading Ken’s book I have an idea of how so many things turned out the way they did. After our lives being turned upside down, everything changed for the better. Out of all that chaos, my steadfast plans emerged. I intimately knew fear during my ordeal but to be cured, I knew there was no place for it. Fear would not take me where I chose to go. Having survived cancer, I am without fear and I understand that anything is possible. Everyday I carry that thought and put it into action. 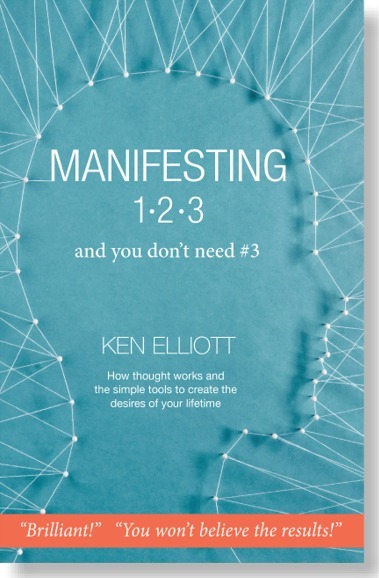 Go to the Interviews page to see and hear Ken talking about Manifesting 123. A lovely and very sensitive understanding of transition. My own shadow self…now transitioning to a life without shadows… is a huge thing. Thank you for sharing Wendy.. and Ken for posting. Hope is with us.. we just have to focus. A little focus can make huge differences! Thank you Mary and again to Wendy for her good example.